Before a recent visit to Pau, the home of the French Paratroopers Museum, if was asked by some friends in the Paratroopers Association in Britain if I could look out for medals of St Michael, regarded as the Patron Saint of soldiers, particularly paratroopers. In the Judaeo-Christian tradition St Michael was the winged angel who led the angels of heaven in the battle against Satan and the forces of evil. Hence, since WW2 many paratroopers have worn a St Michael medal - even if they do not necessarily have a particularly strong religious conviction. However, according to a couple of paratroopers I know of who were with the 6th Airborne Division in Normandy in 1944, even those who had previously declared their religious indifference suddenly found a belief in the Almighty before jumping into battle. Who better, then, to adopt as one's 'patron' than the Archangel Michael? It appears many currently serving French paratroopers wear the St Michael's medal. Relatives often wear the medal to show their support. In France, the lady I asked about the medals in the shop said they sold the medals to paratroopers from many countries. Hence it can be seen that a tradition that began in WW2 has continued to modern times. 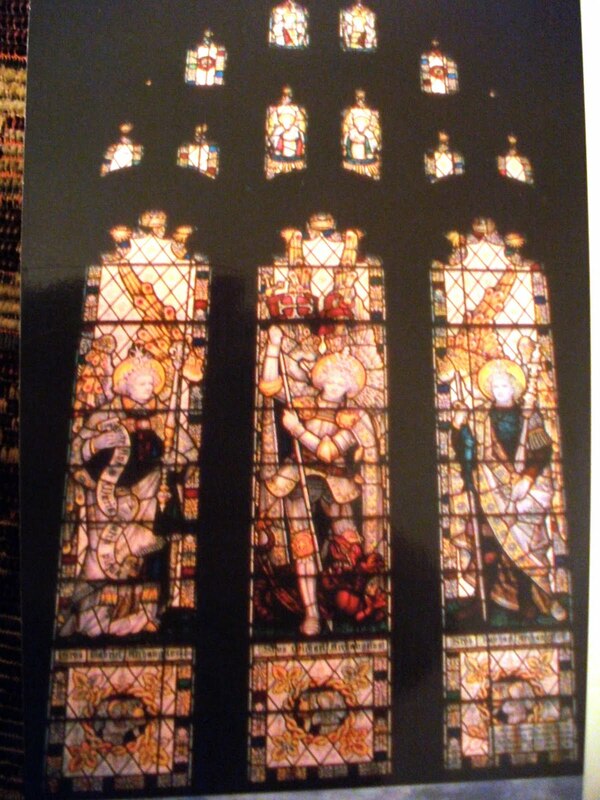 The stained glass window representing the Archangel Michael in the centre of the above photograph is the West Window of St Michael and All Angels Church in the West Cumbrian village of Lamplugh, on the western fringes of the English Lake District. The windows either side of the one of St Michael represent two of the other heavenly archangels - Gabriel (on the left as one looks at the windows) and Raphael (on the right). The Rector of the parish when both WW1 and WW2 broke out was the Reverend Richard Haythornthwaite. He served the parish in this role from 1909 until retiring in 1941 due to ill health. Reverend Haythornthwaite would have retired earlier as by the outbreak of WW2 he was past the retirement age. He then suffered a series of strokes, became partly paralysed and lost much of his power of speech. Because of the war, it was not a simple matter to get another clergyman to fill the post, although for some time neighbouring clergy rallied round to conduct the services while parishioners helped with much of the administration. One particular Sunday morning there was no other clergyman to take the service. Reverend Haythornthwaite decided he would have to take the Communion Service, even though his speech was still almost unintelligible even to his family. With many menfolk away from home because of the war there was perhaps an even greater need for those remaining to attend church. That particular Sunday morning was like many Cumbrian Sunday mornings - dark cloud, rain, hail and sleet, with no clear sky or sunshine. Reverend Haythornthwaite was helped to the church and the service began. At the beginning of the service he struggled to kneel down and prayer. The rain continued to batter against the church windows. Then, a single sunlight beam shone through the church windows, falling on the spot where Reverend Haythornthwaite was kneeling, lighting up his head and shoulder. The good Reverend stood up, went to the pulpit and started the reading from the Book of Common Prayer - speaking as clear as he ever had. The sermon was likewise delivered clear as a bell. Reverend Haythornthwaite finished the sermon, stood down and the sunbeam disappeared. The rain had continued throughout the service and after the service there was still no break in the cloud. Reverend Haythornthwaite's family and many of the parishioners who had attended the service that morning wondered at what happened. Reverend Haythornthwaite's daughter recounted the story of this event for the official written history of Lamplugh Church, written in 2004 by Betty Marshall. During a recent visit to the church while researching the war memorial, one of the churchwardens also mentioned this event. Was this event a 'miracle' or was it just a coincidence that happened at a highly charged moment? Whether there are such things as miracles and angels may be beyond the scope of this article. I think it would be up to each individual what they believe on these matters. 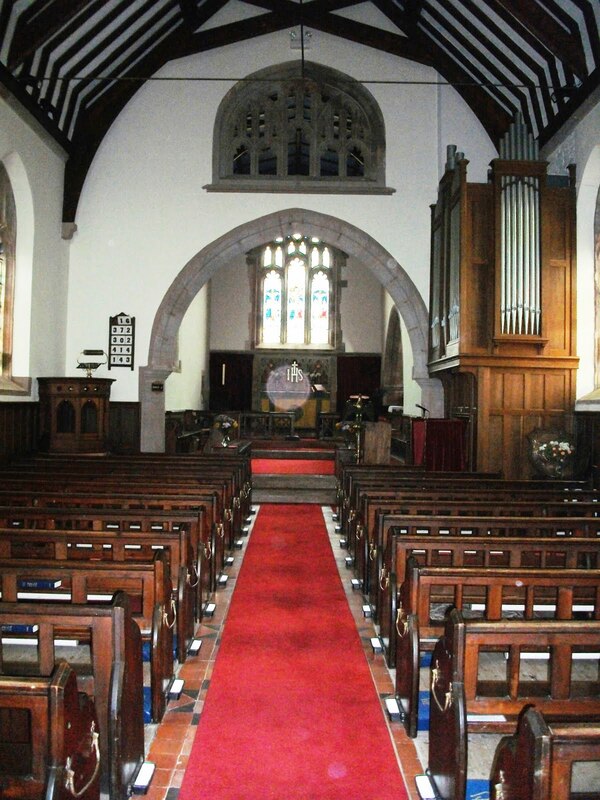 Reverend Richard Haythornthwaite passed away in 1943 and was interred in Lamplugh Churchyard. His wife was later buried with him. The Lamplugh Parish War Memorial (WW1) was first dedicated in 1921 when Rev. Haythornthwaite was Rector. There are 30 names listed. After WW2 an additional 4 names of those who had died in that war were added to the memorial. Visiting Lamplugh Parish Church recently, the main purpose being to research the WW1 and WW2 casualties of from the district I took a photograph of the interior of church interior, seen above. Mindful of the WW2 story about Reverend Haythornthwaite recounted in the previous section, something unusual happened during my visit. A ray of sunlight shone through the church windows, striking the altar which has a shiny metal engraving of ‘I H S’ (which stands for ‘Jesus Saviour of Mankind’) on the front of the altar. The sunlight was reflected back into the church, giving the appearance of a halo of light in front of the altar – more or less exactly as Reverend Haythornthwaite’s daughter remembered from the war years. I took a photograph of this strange light and it has come out on the photograph. This strange lighting effect lasted for a few moments and eventually disappeared. A natural phenomenon it may have been, but in this particular church it was rather surreal nevertheless.